Today is the release day for the Clearly Besotted October Release and I have one last card for you. All sets will be released at 8pm BST tonight (1st October) at Clearly Besotted and Simon Says Stamp. 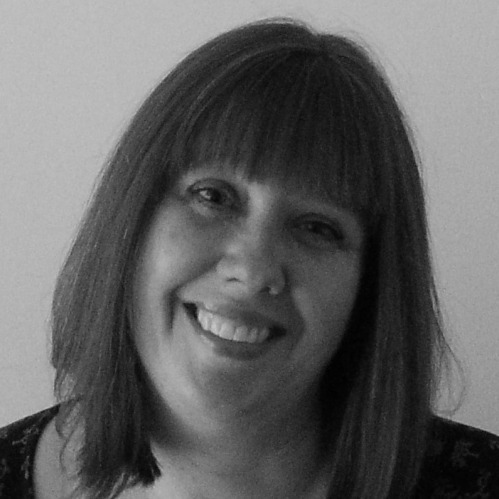 I will send another post out later today with links to all the products should you wish to take a look – we hope that we have inspired you and I would love to know what your favourite sets are. But, before then, here is the card for today. 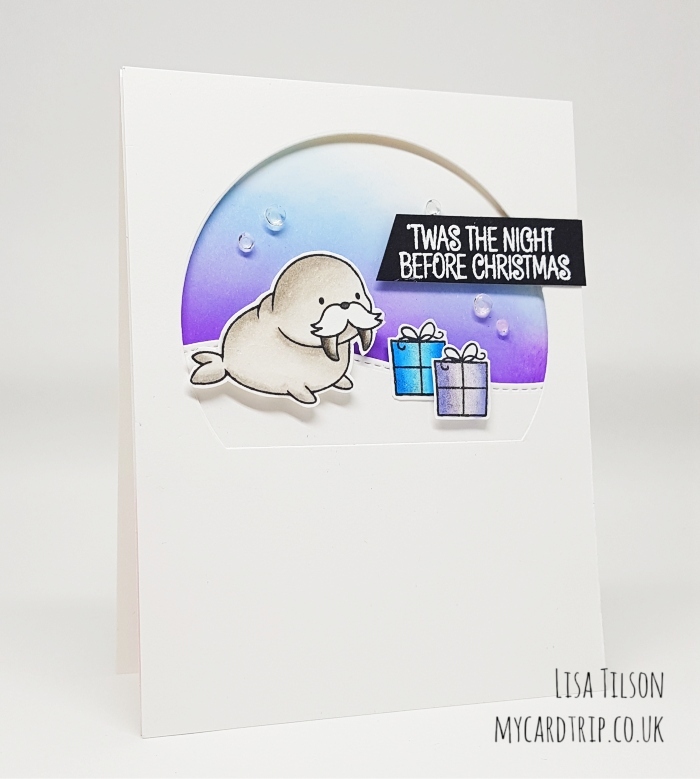 This card features the new Winter Walrus, All I Want and Merry Mouse sets. I began by taking a panel of white cardstock and die cutting the arch window. I then took another piece of white cardstock and die cut a stitched snow drift. This was attached to the back of the arch window panel with wet adhesive. I temporarily laid the window panel down onto my base card and used a pencil to lightly mark the area where I needed to blend my inks onto the base card. Using a mini ink blending tool I blended Tumbled Glass and Wilted Violet Distress Oxides, fading out towards white at the top. These inks are a dream to blend! The walrus and presents were stamped with Memento Tuxedo Black ink and Copic coloured (numbers listed below). The presents are from the All I Want set which features a trio of darling unicorns but I just used the present from this set. Coordinating dies will be available for all the sets, but I fussy cut my images leaving a white trim. The window panel was popped up with foam tape onto my base card. The walrus and presents were then adhered with foam tape. 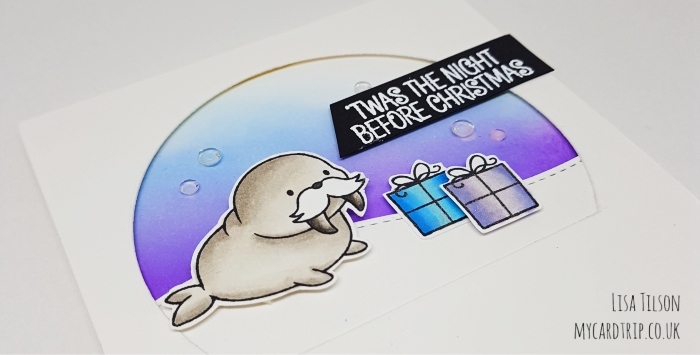 Behind the walrus’ head is two sets of foam tape so that it sits flat on the card, similarly with the purple present. And of course I couldn’t resist a little bit of shimmer on the presents. The greeting from Merry Mouse was stamped with Versamark Ink onto black cardstock, white embossing powder applied and then heat set. This was adhered with wet adhesive on the right hand side and foam tape where it overhangs the arch. A few Ice Cube jewels from Lucy’s Cards were added to give a little more interest to the background. That finishes my final card for the countdown teasers. Thank you all so much for visiting me this week, I really do appreciate it. I am sure Stephanie, Michelle and Keren have created some gorgeousness for you today if you could spare a few minutes to see what they have made. Another post will follow later on with the links to the fabulous new release but in the meantime, happy crafting! Darling card! 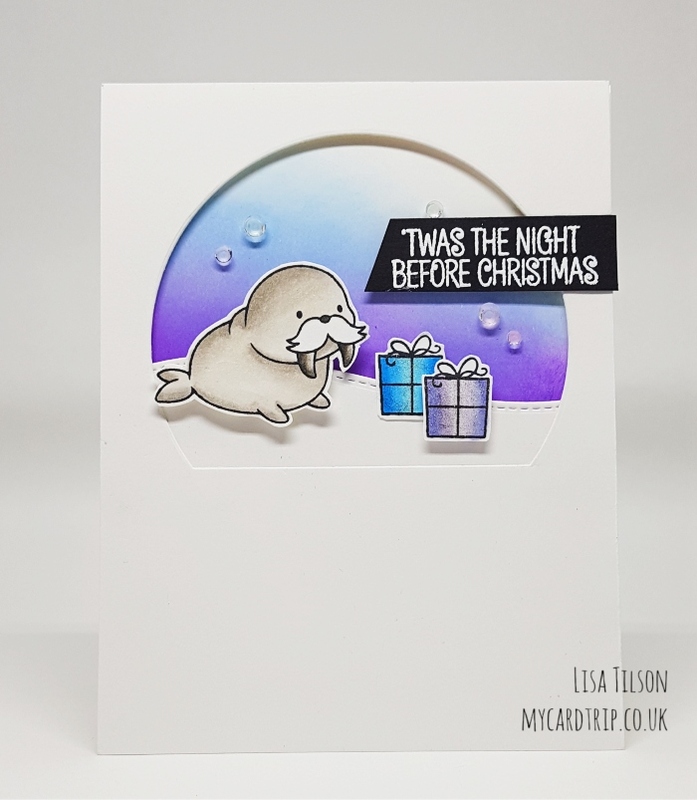 Love the walrus! Great card . Love the release. All your cards are fantastic.